Water is supplied to many homes via water supply network. But it might be quite easy to get your water elsewhere, even if you’re living in an urban area. Water in most areas is not something difficult to obtain. There are many creeks, rivers or ponds, you can use for satisfying all your water needs. Even if you don’t have any surface water, you can use the groundwater, but you need to pump it up first. 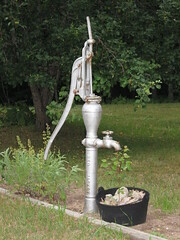 There is a lot of different pumps you can use — hand pumps, pumps driven by electric engines or internal combustion engines and even pumps powered by windmills. If you don’t have any surface water nor groundwater, the only thing left for you is to collect rainwater. In most cases the roof above one story building is enough to supply all the water needed by it’s inhabitants. Using your own water may force you to save it, for example by using greywater recycling system. Or to use eco-friendly faucets and shower heads. Using water means generating waste. Nothing to worry about when planning your off-grid home, as it’s easy to utilize and neutralize this waste water on site. 2 Responses for "Off the water supply network – introduction"